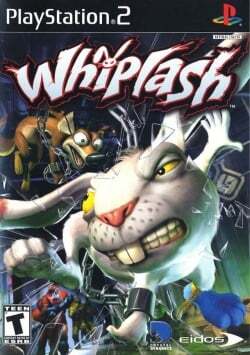 Game description: Join a shackled animal duo on a mission to both escape and sabotage an evil animal product-testing corporation. Ironically, the chain that links the rabbit, Redmond, to his weasel pal, Spanx, becomes their biggest weapon It can be used as a whip, a grappling hook, or a helicopter. Together, they'll battle a band of baddies, including a giant-syringe-toting doctor, an unsanitary surgeon, crooked rent-a-cops, vicious guard dogs, and a corrupt CEO. The more enemies you defeat, animals you free, and equipment you demolish, the further you drive the shady corporation into bankruptcy. USA v02.20(10/02/2006), Extreme light game for any cpu/gpu., A little glitch in the mains characters,but its inperceptible,in the hardware mode(not disturb the gameplay),Software mode its fine. Description: In Hardware mode mipmapping issues cause several object and character textures to appear distorted from a certain distance. Workaround: This can be resolved with the latest v1.5.0 git builds. Go to Config > Video(GS) > Plugin Settings, and set Mipmapping to "Basic". For older versions set Renderer to Software mode by selecting one of the "(Software)" options and check that Mipmapping is enabled. Press the insert key in-game to toggle mipmapping. This page was last edited on 19 November 2016, at 11:54.